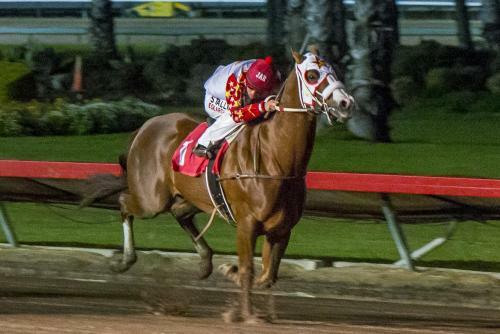 Jim Walker’s homebred Zoomin For Spuds became the fifth horse to qualify four or more times to the prestigious Champion of Champions after scoring a wire-to-wire victory in Sunday’s Grade 1, $157,200 Brad McKinzie Los Alamitos Winter Championship at 400 yards. ZoominFor Spuds joins five-time Champion of Champion finalists Refrigerator and Jess You And I plus four-time finalists Whosleavingwho and Heza Dasha Fire as the only horses to have qualified four or more times to the Champion of Champions. All five of these horses have won the Champion of Champions at least once, with Zoomin For Spuds winning the 2016 edition during his 3-year-old campaign. The now 6-year-old gelding finished third in the 2017 running and was fourth to AQHA World Champion Bodacious Eagle in the 2018 renewal. The 2019 edition of the Grade 1, $600,000 Champion of Champions will be held here on Saturday, December 14. Owned by Lisa Beauprez, Thomas Bradbury, Thomas Bradbury, Jr., and Paul Jones, Eyes The Favorite flew from the outside post 10 to finish second in the Brad McKinzie. Ridden by Carlos Huerta for trainer Paul Jones, Eyes The Favorite earned$26,724 for his effort. The Favorite Cartel gelding was also second in the Grade 2 Southern California Derby in his final start of 2018. Ridden by Eduardo Nicasio, Katies Easy Moves earned $18,864 for running third. The Maknmoves gelding continues to perform well at the top level. In 2018, he was second to BH Lisas Boy in the Grade 1 Bank of America Championship Challenge and fourth in both the Grade 1 Robert Boniface Los Alamitos Invitational Championship and Grade 1 Vessels Maturity. Ed Allred’s He Looks Hot earned $11,004 for running fourth to take his career earnings to $1,213,423. Chance To Fire finished fifth and was followed by MyFavorite Check, Yanque, LD Is Back, Da One Two Special and Tarzanito.